Lovecraftian horror is something I only really discovered earlier this year. Sure, I’d seen the superhero episodes of South Park, where Cartman teams up with a My Neighbor Totoro-style Cthulhu, but it wasn’t until recently that I started diving into the stories and mythos—as well as the legacy they left behind. One of my favorite ways the now-public domain sub-genre has continued to this day is the Lovecraftian roleplaying game. Over the past several weeks, I’ve been highlighting different amazing horror games, and early on I promised to showcase a Lovecraftian roleplaying game. At first, I wanted to go deep cut, because there are some amazing (and obscure!) ones out there. 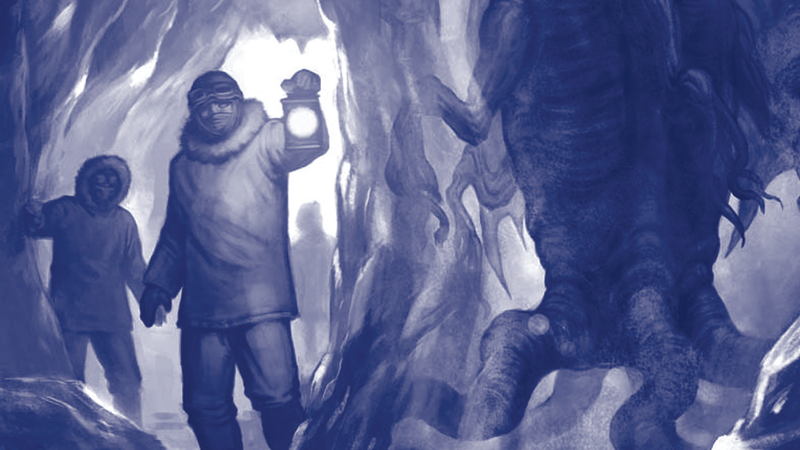 There’s Trail of Cthulhu, a tribute to classic investigative noir (available free as a PDF). You’ve got CthulhuTech, a futuristic Lovecraftian tale set after the apocalypse. Then there are some that haven’t even been released yet—like Unspeakable: Sigil & Sign, where players take on the role of devout cultists, and is set to come out next year. But there’s one that rises above them all, the truest of the Old Ones. And that’s Call of Cthulhu. Call of Cthulhu has been around for decades, and for good reason. Created by Sandy Peterson, it’s widely considered one of the best roleplaying games ever created—not only for its interesting storylines, but also for how it subverts the typical RPG genre. Unlike games like Dungeons & Dragons, Call of Cthulhu is about pain and loss. You’re always outmatched, outclassed, and overwhelmed by the threats you face, and the rewards usually aren’t dropped loot, kingdoms saved, or love everlasting. Rather, the true reward is in doing the right thing, no matter the cost. This game isn’t about the hero getting a happy ending—saving the world often means sacrificing your mind, body, or sanity. During the game, players take on the role of investigators trying to solve otherworldly mysteries. It could be a haunted clubhouse, a mysterious creature lurking in a park, or the attempted rising of an underground aquatic evil. The official version from Chaosium is on its seventh edition, and the website hosts several different versions and storylines to play—including Horror on the Orient Express, a massive group campaign spanning continents and containing up to 19 adventures. In addition, there are dozens of additional scenarios that outside writers and fans have created, many of which are available for free online. If you’ve got some favorites of your own, be sure to leave links in the comments. While Call of Cthulhu can sound daunting, given its decades of history and devoted fanbase, it’s actually one of the easiest games to pick up for those who haven’t played RPGs before. For example, the official Quick Start Version, which you can download for free as a PDF, comes with instructions designed to help newcomers navigate creating their first investigator. I’ve also been playing through the solo campaign, Alone Against the Flames, as a way to practice and connect more to my character without the pressures of a group. It’s also available for free as a PDF. It might sound weird to play a roleplaying game by yourself, but it’s actually a lot of fun. It’s basically like a Choose Your Own Adventure book or Inkle’s fantastic 80 Days video game—only with more sadness. At last, science explains the physics in "Call of Cthulhu"